A huge quite rare WMF Ikora glass vase called “soccerball”. 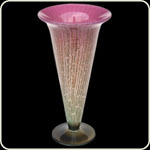 It is the standard design what makes the Ikora glass so popular. 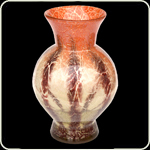 The vase is made from clear glass with brown stripes and a red colored rim. Tall: 15.2″ Mint condition. 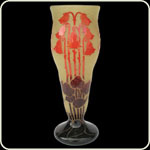 An awesome huge Gallé cameo glass vase with a flower design. The colors from the vase are yellow, orange, dark orange and red. Tall: 13.6″. Signed: Gallé. Mint condition. Le Verre Francais glass vase with Swan motif, 1927-1929. On a base graduating from white to smoky orange hues, mottled yellow, acid etched cameo relief design of opposing long-necked swans under a garland of leaves. A spectacular effect of water. Signed `Le Verre Français` and `Charder`. Tall: 9.0″ Mint condition. Awesome Galle glass vase with boat scene. 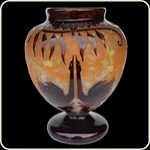 A very rare, wonderful Galle glass vase. Superbe quality Gallé glass vase with a nice boat scene. Perfect colored and etched. An outstanding collectors item. Tall: 8.0″. Signed *Galle (1904 – 1906). Mint condition. 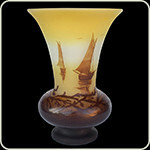 Posted in Galle | Comments Off on Awesome Galle glass vase with boat scene. 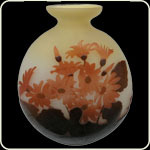 An awesome huge Muller Fréres cameo glass vase with a chrysanthemum flower design. The colors from the vase are off-white, yellow, orange, dark orange and brown. Tall: 10.0″. Signed: Muller Fres Luneville. Mint condition. A huge and wonderful Galle glass vase. 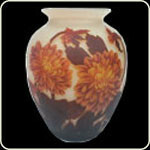 Superbe quality Gallé glass vase with a nice Oxeye daisy/Marguerite flower design. Perfect colored and etched. An outstanding collectors item. Tall: 10.0″. Signed Galle. Mint condition. 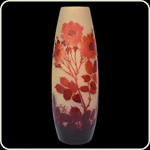 A awesome huge Degue glass vase with a wonderful flower design. 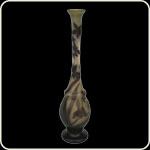 The vase is acid-etched, ground color is off-white with a dark brown/blue and red overlay. Tall: 16.4″. Signed Degue and made in France on the bottom. Mint condition. Galle Glass Vase. Very fine example of a long vase with a leaf patern decoration. Nice amber and brown color among neck and base. Tall: 9.2″. Signed Gallé. Mint condition. Huge ~15.0″~ WMF Ikora Glass Bowl strange unusual colors. 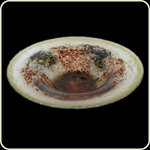 Posted in WMF Ikora | Comments Off on Huge ~15.0″~ WMF Ikora Glass Bowl strange unusual colors.